Totally Tim Burton, isn't it? 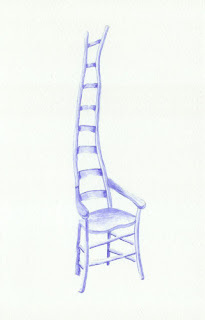 Brooks’ ladderback chairs are fine examples of his work. The beautifully shaped solid wood seats, arm rests, and back slats are combined with organically shaped branch material for the legs and rungs. The branch material was finished in black lacquer, and overlaid with colored scribble-like figure.